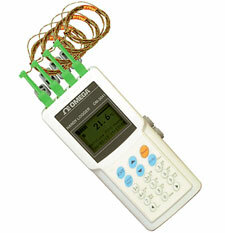 The handy OM-2041 is a palm-size data logger capable of storing up to 10,000 data records per channel. Powered by either “AA” batteries or an AC adaptor, the OM-2041 works equally well as a portable or a fixed-location logger. With the exclusive software, recording/recalling of data and programming of logging parameters can be done directly with the logger or through a personal computer.